Here’s a turn up for the book: JJ Lehto will join Krohn Racing’s line-up at next month’s Rolex 24, and will drive a Daytona Prototype for the first time. The Finn will partner Colin Braun and Max Papis in the #76 car, while Tracy Krohn, Nic Jonsson and Boris Said will drive the #75. 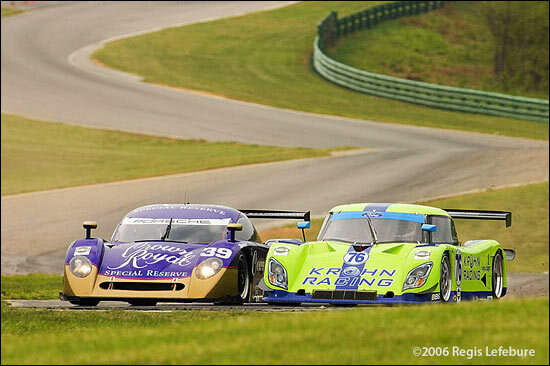 As suspected, the green Rileys will revert to Pontiac power for 2007, having been Ford-powered in 2006 (except at the Rolex 24). The regular line-ups for the rest of the season will be Jonsson / Krohn and Braun / Papis – so Max replaces 2006 Champion Joerg Bergmeister, who is expected to be only Porsche powered next season. Here's Joerg Bergmeister pulling off a remarkable move at VIR this season (below): expect similar action with Lehto at the wheel. they went side by side through the next left and right. Noboody passes in these esses, much less run side by side!"